Play with the top card of your deck faceup. Once per phase, you may play the top card of your deck as if it was in your hand. When playing a card this way, Gandalf is considered to have the printed Leadership, Lore, Tactics, and Spirit icons. At the end of the round, discard Gandalf from play. 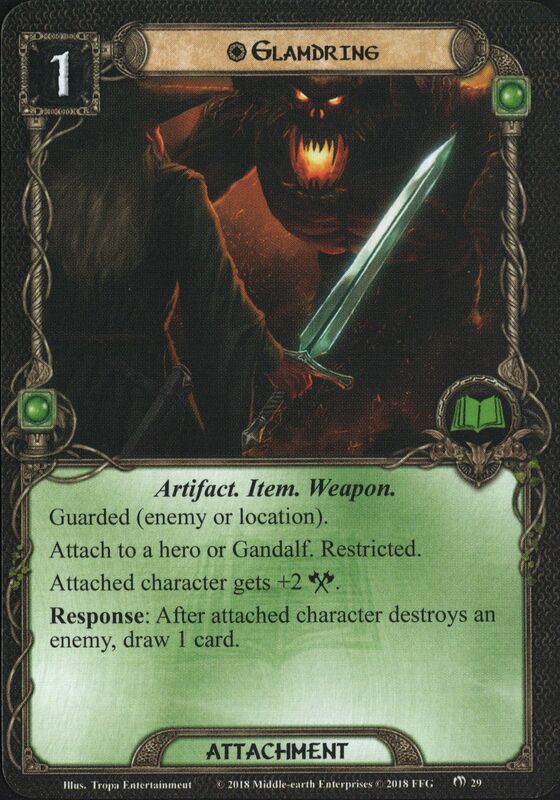 Response: After Gandalf enters play, (choose 1): draw 3 cards, deal 4 damage to 1 enemy in play, or reduce your threat by 5. Gandalf does not exhaust to commit to a quest.Forced: At the end of the refresh phase, discard Gandalf from play. You may raise your threat by 2 to cancel this effect. Attach to Gandalf. Action: Exhaust Gandalf's Staff to (choose one): choose a player to draw 1 card, add 1 resource to a hero's resource pool, or discard a shadow card from a non-unique enemy. Action: Look at the top X cards of any player's deck, add 1 of those cards to its owner's hand, and return the rest to the top of the deck in any order. Attach to Círdan the Shipwright or Gandalf. Attached character gains a Leadership resource icon. Action: Exhaust Narya and attached character to choose and ready up to 2 allies. Each of those allies gets +1 Attack and +1 Defense until the end of the phase. Attach to Gandalf. Gandalf gains ranged and sentinel. Action: Exhaust Shadowfax to ready Gandalf. Guarded (enemy or location). Restricted. Attach to a hero or Gandalf. Attached character gets +2 Attack. Response: After attached character destroys an enemy, draw 1 card. Attach to a Warrior hero or Gandalf. Attached character gets +2 Attack. Response: After attached character destroys an Orc enemy, draw 1 card.